20 MMS March 2017 mmsonline.com ONE-OFF Commentary Parallels exist between electrical discharge machining (EDM) and additive manufacturing processes for industrial part production. CNC EDM equipment arrived on the scene in the late 1970s. Soon after, it was ballyhooed by some as being the nonconventional machining technology that would sound the death knell for traditional chip-making processes for part pro- duction. 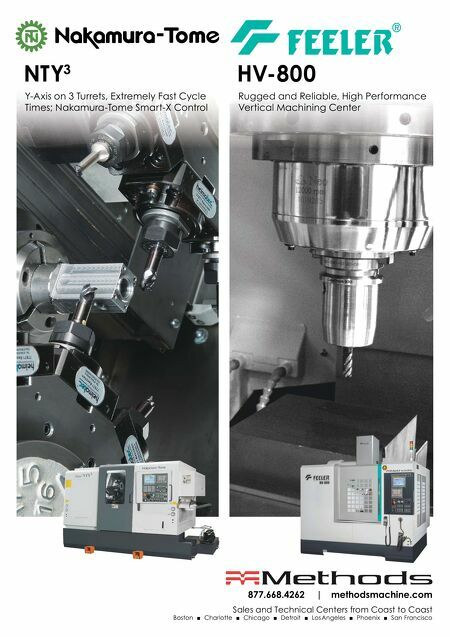 EDM (in its wire, sinker and hole-drilling versions) has since settled into a comfor table niche for machining very hard, electrically con- ductive materials. Common applications include machining mold cavities, micromachining and creating diffuser holes for turbine blades. Conventional milling and turning remains. Similarly, some pronouncements about bur- geoning additive technology—largely from main- stream media outlets—suggest that it will result in the eventual demise of subtractive machining operations. You know what? That won't be the case, either. Conventional milling and turning will remain. EDM technology is more mature compared t o a d d i t i v e , a t l e a s t i n t e r m s o f a d d i t i v e being applied for production. The speed and EDM and Additive Manufacturing Similarities Like electrical discharge machining, additive offers manufacturers an alternate part-production option. However, conventional machining won't go away. capabilities of EDM have advanced with develop- ments such as digital generators, linear motors, "turn-and-burn" operations, reduced wire and fine-hole drilling diameters, and even probing capability. However, to the extent that it excels in certain applications, it remains a technology that complements conventional machining. Addi ti ve still fac e s hu rdl e s in th e for m of accuracy, surface finish, slow build time, limited work envelope and so on. In fact, secondar y conventional subtractive machining operations are sometimes required for additive parts to allay issues such as these. That said, these challenges will continue to be addressed by additive equip- ment manufacturers, material developers and even end users in the coming years. To be sure, additive, like EDM, will have an impact on par t production, largely because it can create forms and features that are difficult or impossible to produce via conventional machin- ing. In fact, it will change the way designers think about alternate forms and features they can now integrate into their new products. Still, conventional machining isn't going away. Instead, additive will settle into its own niche as yet another complementary technology to sub- tractive machining. This is summed up nicely in Peter Zelinski's ar ticle that star ts on page 66 about Imperial Machine & Tool's use of selective laser melting (SLM) technology, in which he writes: "Imperial has now integrated additive into a shop-wide process in which additive is no longer something special, but instead has a seat at the table that is equal to all of the other con- tributors to a given job's success." 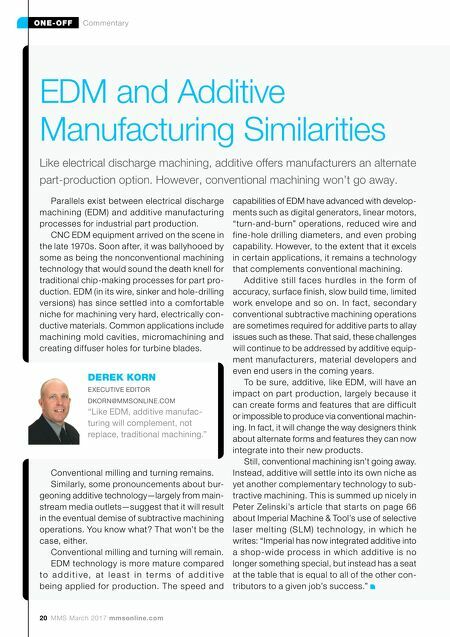 DEREK KORN EXECUTIVE EDITOR DKORN@MMSONLINE.COM "Like EDM, additive manufac- turing will complement, not replace, traditional machining."